Staring into the glaze bucket all last week got me thinking about my workhorse base glaze, Third (Fourth? Fifth?) Best Possible White. I brought it back from Tuscarora Pottery School along with half-a-dozen other recipes, including BP Blue, Yellow, Black, and a cool faux ash glaze that started by mixing a batch of cement and putting it into the freezer. It sat in my notebooks for two years in Wisconsin, three years of grad school (where I was firing unglazed sculpture at cone 6), and a couple more at the Craft Center, until our shop white glaze, Coleman White, started shivering. It wasn't the glaze's fault. Obviously, something had changed in the clay body itself, causing greater thermal expansion and shrinkage than before, and little bits of glaze started popping off of sharp edges and rims. Had the glaze been more exciting, we would have tweaked the formula to match the clay, but it was a dull grey-white with little in the way of iron-spotting, so we decided to try some other recipes. Right away, I saw that BP White would need some work. It's more than 20% raw clay, necessary in a glaze that goes on unfired pots. Clay shrinks as it dries, and this glaze shrinks with it. Bisque pots don't shrink, so I needed to substitute calcined (pre-fired) clay for some of the raw stuff. Since calcined kaolin is commercially available, that was my first choice. Compensating for chemically combined water and organic matter lost in firing, that's 8.5 parts calcined kaolin. Then there's the matter of suspension. Glazes tend to settle to the bottom of the bucket unless you add something to keep them floating. Dennis Parks at Tuscarora favored organic suspenders: gum arabic, gum tragacanth. They worked well, but quickly began to decay. He liked to claim his glazes had the bouquet of French cheeses. I thought they smelled like cowshit. I used 2% bentonite. I also discovered that the glaze wasn't very white over our buff-grey body, so had to add an opacifier. Tin oxide is the best ceramic opacifier, but it was incredibly expensive (something to do with armed conflict in Bolivia, I think). Twice as much zircopax would do the job just as well. Ball clay has much more wet shrinkage than kaolin, so was definitely the culprit. 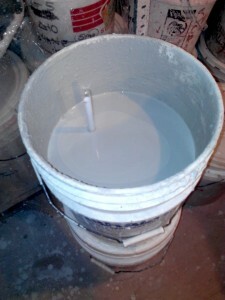 By calcining the ball clay instead of the kaolin, we got the shrinkage on the drying glaze to a manageable level. Back to 10% kaolin, 8.65% calcined ball clay. Since that's not a commercially available product, every now and then we'd have to run a big bowl of powdered ball clay through a bisque firing. I used this glaze for years, after leaving the Craft Center and starting my own pottery business at Club Mud. The only major headache with it was the zinc. You probably know zinc oxide as the white stuff you put on your nose to prevent sunburn. 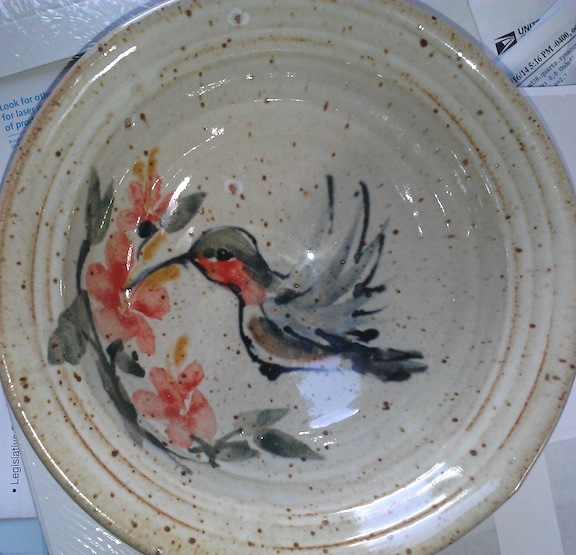 In pottery, it's used in small amounts to give a "buttery" surface to glazes. Problem is, it's hygroscopic (holds on to water). Even if you calcine and grind it fine, exposure to ordinary Oregon humidity causes it to form clumps that don't dissolve in water, and don't go through the glaze screen. It's hateful to use, because you never know exactly how much is in the glaze, and how much you had to dump in the trash. Fortunately for me, one of my colleagues at Club Mud is a retired engineer, and an experimentalist. We're firing in reduction, he reasoned, so well before the glaze melts, the zinc oxide is reduced to metallic zinc, which has a very low melting point, not to mention evaporation point. He figured putting zinc in a reduction glaze was tantamount to plating it on the inside of the chimney. So I tested BP White without zinc, and couldn't see any difference. Hurray! Then came the Great Gerstley Scare of January 2000. US Borax announced it would no longer be mining Gerstley Borate, and panicked potters had a run on the mineral, bought out suppliers almost overnight. I bought a couple of bags, myself, to be sure I had a supply for the short run. And I sat down to recalculate the recipe using commercially available glaze frit for the long term. Having done glaze substitutions longhand in the past (systems of simultaneous equations! Yikes! ), I was happy to avail myself of a studio-mate's glaze calculation software. With a little fiddling, I came up with a pretty close match, chemically speaking, using Ferro Frit 3195 with a little whiting to make up the extra calcium. And I rationalized the clay content a little, making it a little easier to measure out a batch. Of course, right after that, they announced that they'd found a ten-year supply in a warehouse somewhere, and the stuff is still available now in 2014, though I don't know how well it sells, because we're all still using up our panic purchases. I expect mine to last, well, forever, because I'm only using it a teaspoon at a time. You see, changing out the Gerstley fixed another problem I'd been having, thumbprint lift. That's what happens if you pick up a pot before the glaze is dry enough to handle--it sticks to your finger or thumb and pulls off the pot. There's no good way to fix it, short of cleaning off the glaze and starting over. Since Gerstley Borate is hygroscopic too, it takes forever to dry, especially in an Oregon winter. Using a frit fixed that. On the flip side, though, my decorating time was greatly reduced. The new glaze version got dry and powdery very fast, making it hard to paint on. I was considering using organic binders, smell or no smell, when another potter at my studio made a suggestion. Just add another percent of bentonite, he said, and that will solve it. And it did. The final change is also a result of the frit substitution. Without the suspension properties of Gerstley Borate, the glaze settles like a rock to the bottom of the bucket. A rounded teaspoon of epsom salts per 7000 gram batch solved the problem. The first year I did the Best of the Northwest Holiday Sale, I happened to be three booths away from another ceramic painter, a fellow with paintings on porcelain tile. Friday was sort of slow, so I was playing with my demonstration brush and magic paper (sumi-e practice paper that turns black with water, then erases itself as it dries), and invited him to have a turn. He turned me down with a sneer, saying he never used "stick-and-hair" brushes, but imported his at a premium from China. He added that he couldn't paint without at least six distinct and distinguishable shades of red, and I don't know what all else because I was still steaming from "stick-and-hair." It gave me great and only slightly guilty pleasure to outsell him all weekend. But I like a limited palette. I'm not making fine art for the ages, I'm painting pots. I don't want to have to pause and decide between six shades of red when painting a flamingo mug. I'm good with one. Black. A lot of people make black from scratch by mixing a bunch of different metal oxides. I prefer it simpler. Chrome-free black Mason stain, mixed 50:50 with Gerstley Borate. About a teaspoon of each with enough water to suspend will fill a 35 mm film can. I want it about the consistency of ink for line drawing. Chrome-free because chrome is refractory (resists melting) and a chrome-bearing black stain will bubble and blister. Blue. Straight cobalt carbonate. I have full strength in the bottle, and dilute with water in the cap for shading, shadows. Cobalt has a lot of tinting strength. You can dilute it three or four times and still have a shade of blue. (I also do the dilution trick with the black to give me grey shades for everything from shadows to crows.) The one drawback to painting with cobalt is that it changes color in the firing. The raw mineral is lavender colored, the finished pot, true true blue. Yellow. Rutile is a mineral containing roughly equal parts of iron and titanium oxides. I use it straight in water to get a gold-yellow color not unlike the ochre horses in cave paintings. Red. I used to use copper carbonate for reds, but it's so dependent on kiln reduction. I'd wind up with roosters with liver-colored combs, or even apple green, as often as red. But all the other choices for red in ceramics only worked at low temperatures. In a stoneware kiln, they'd burn out and go up the chimney. Then a company called Degussa invented zirconium encapsulated ceramic stains, reds and yellows and oranges that were stable at cone 10. Now made by Cerdec, they're spendy as all heck, but I use them by the teaspoonful, mixed 50:50 with Gerstely like the black stain, and do a lot more patterns with red these days. Orange. I wet-mix equal amounts of rutile and red stain. Much better that the Degussa orange, which is kind of anemic. Brown. I'm still using the Cardew iron overglaze recipe I learned at Tuscarora. By weight, 80% red iron oxide, 20% Red Art clay. Green. Green is traditionally chrome oxide, which is bright grass green in unfired state as well. Pure chrome interacts oddly with my base glaze (Third-Best Possible White. I've made some changes over the years), coming up a muddy peach color. To compensate, I use a mix of chrome oxide and cobalt carbonate, but since chrome is refractory, I've taken to mixing in Gerstley Borate as well. By volume, a quarter chrome oxide, a quarter cobalt carbonate and half Gerstley.